Defecaitlin fights through Terminal City's pack. No surprises at this weekend’s Quad City Chaos, unless Montreal’s New Skids being even better than advertised could be considered a surprise. Montreal easily won the first annual Quad City Chaos invitational, posting lop-sided victories over all involved, including topping 200 points in two of their three bouts. CN Power (2-1) finished a strong second in the tournament, with Hammer City’s Eh! Team third after edging a game Terminal City squad in an exciting and closely contested conclusion to the tournament. The bouts involving CN Power, The Eh! Team, and the Terminal City All Stars were all close, hard fought battles, with the teams often changing leads. The differences between these three teams were negligible at best, and you got the feeling that on any given night any one of these teams could prevail. That parity made for an exciting weekend and bodes well for the future of roller derby in Canada. After a disorganized, and potentially jet-lagged opening half against the CN Power, Terminal City noticeably improved with each bout, often quickly adapting to the nuances of the eastern game and the strategies of the opposing teams. Brim Stone and Perky Set at the top of the pack. Skater for skater the girls from Vancouver matched up well. Despite the 0-3 record, The All Stars showed moments of brilliance over the weekend; at times this team was like a shape shifter, adapting to and countering strategies of other teams. They were capable of keeping Montreal under 200 points (160) almost solely due to their defense on power jams. Not wanting to get into a slow, strategic positional-blocking battle with the Skids, they instead elected to race ahead of the Montreal blockers and stretch the pack to encourage one on one battles. This also forced the jammer to work twice as hard, resulting in extremely fast-paced, low scoring jams. The Eh! Team looked a little unpracticed at times this weekend, with loose formations and no answers to the pack strategies being employed by the Skids. 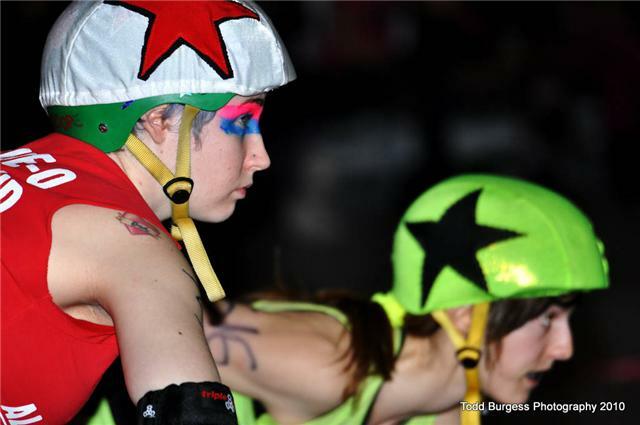 But they had some great jamming and also improved with each bout and will undoubtedly use this weekend as a starting point for what should be a challenging but exciting WFTDA season. 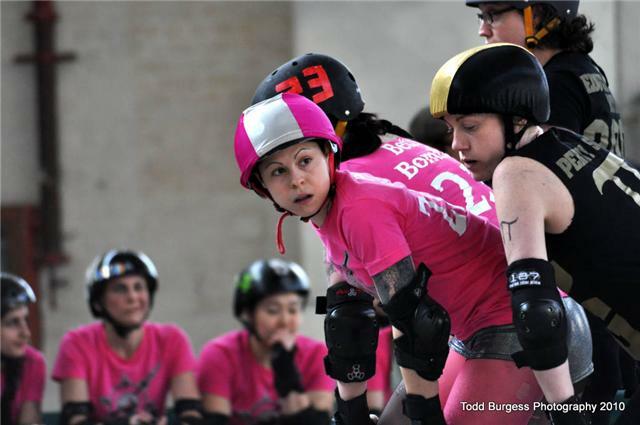 Even missing a few star players, The New Skids on the Block look poised to make a breakthrough in WFTDA’s Eastern division. Almost militant in their preparation and surgical in the execution of strategy, Montreal constantly frustrated the other teams with a few different blocker traps (at the back and on the line), some well-timed and well-placed hits, and an almost unhitable arsenal of jammers. 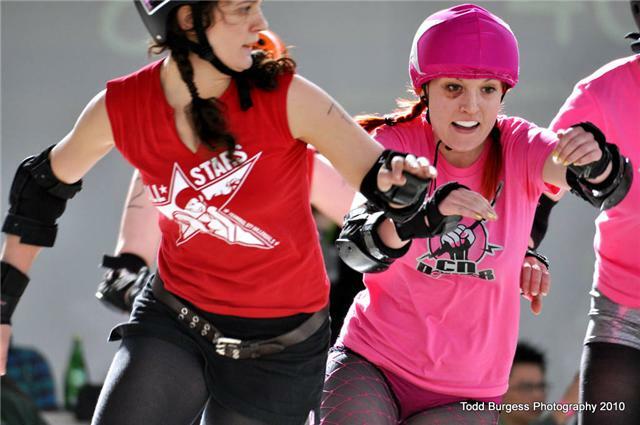 This is a team to watch in 2010, and, as long as the players stay healthy, should make its well-deserved debut in the WFTDA Regionals. Collide-O-Skope Kid and Iron Wench at the line. Such a long tournament and there were so many amazing performances that it is hard to narrow down key players on each side. 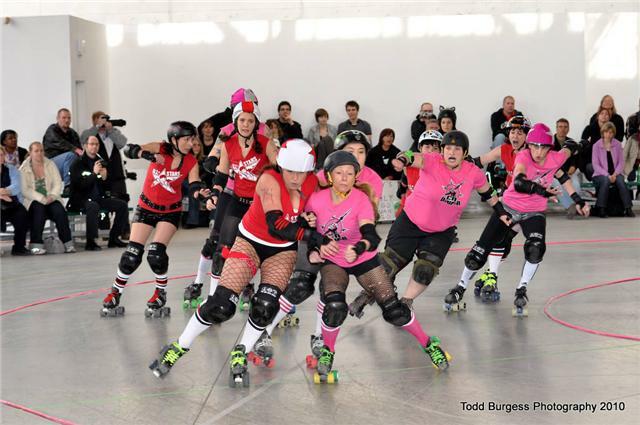 Terminal City’s Lambe Baste Her, Luludemon, and Roller Girl provided strong jamming all weekend, while Barra Couga was a tenacious thorn in more than a few sides. LA Gunns did not look like someone returning from a major injury and delivered some serious hits in the pack, and 8-Mean Wheeleer provided solid leadership. For the Eh! Team, Carla Coma and Vicadoom continued to carry the jam load, but big hitter Bitchslap Barbie stepped in against TCRG and put up a lot of points in the victory. Perky Set battaled hard all weekend, and Lock N Roll made her return to The Hangar wearing a visitor’s jersey for the first time, and looked up to the tastk, even taking her turn with the star against her former CN Power teammates. The New Skids on the Block simply had no weaknesses in its lineup. The Iron Wench continued to show that she is a world class jammar, with strong suport from Lyn-dah Kicks and Georgie W. Tush. Jess Bandit proved that she can lead a pack with the best of them, and Ewan Wotarmy and Smack Daddy did double duty, providing solid pack blocking with some energetic jams. Mach Wheels holds Avi Hater outside while Lunchbox takes the inside. Any way you look at it, this was an extraordinarily successful weekend for the members of CN Power. They had an opportunity to test themselves against the best that the country had to offer and managed to grind out two impressive victories; perhaps more importantly, they faced intelligent, tough opponents with different strengths and weaknesses, which will undoubtedly teach them a lot going forward. While the two victories were important, the way they happened was potentially more so. Feeling confident and urged on by the home crowd, CN Power came out flying in its opening game against Terminal City. Employing a strategy of slow packs and aggressive jamming (reminiscent of their victory over The Rideau Valley Vixens), the trio of Lunch Box, Land Shark, and Defecailtlin lead the team to a huge lead early against a bewildered, and unfocused Vancouver squad, taking a 40 point lead into halftime. But the second half was another story and the All Stars were like a different team–relentless defense, aggressive hitting, and defensive jamming all contributed to a much more competitive second half, and although CN Power held on for a 97-79 victory, they paid a physical price for it in the end. The effects of playing back-to-back bouts were obvious as the hometeam fell behind early against their provincial rivals from Hamilton (55-49 at the half). But CN Power, still stinging after a two year losing streak to the Eh! Team, sent a clear message in the second half: the team has come to play in 2010. With Defecaitlin seeing limited action due to injury, Bambi stepped up and provided key jams in the second half, and in a spirited effort, CN Power took the lead and held on for an amazing 89-87 victory. It was a different story against the Skids. After an emotionally exhausting Saturday, CN Power was never really able to get anything going against the powerhouses on Sunday. Constantly frustrated, CN Power did show signs of the potential for a stronger performance late: even in the face of such opposition, Lunchbox was her usual calm self and provided some much needed consistency at the jam line, and Land Shark displayed a new level of toughness mixing it up with (and even getting the better of ) Montreal’s super pivot Jess Bandit on a few occasions. CN Power also showed some ingenuity in the second half including giving Montreal a taste of its own medicine with a well executed trap. But in the end the inability to defend against the power jam allowed the Skids to run up the score. Brim Stone and Rebel Rock-It provided solid leadership up front all weekend and Nasher the Smasher, making her 2010 debut, also looked comfortable in the stripe. Mach Wheels continues to impress with her unbelievable control and poise and made more than her fair share of hilight-worthy assists on the weekend (including an impressive ‘waitress’ against the Skids). This weekend also saw the launch of ToRD.TV, a site dedicated to hilighting ToRD and its skaters. Keep an eye out for upcoming specials (interviews, bout hilights, etc…) from this weekend’s Quad City Chaos. I have to say I was very, very impressed with Lunchbox this weekend. She gets my TORD MVP. The Gores sure know how to pick jammers. Although we were 0 and 3 (shakes fist) this tournament was a great shakedown for our team. It was awesome to meet our sisters out East and play some really challenging games. I’m super proud of how we did. No excuses- we could have done better- but next time we’ll get you all back. When’s the rematch? Shift Kicker, it was a pleasure to watch you guys play. Hopefully one day we’ll all meet again at a Canadian Championship…or another Derby Night in Canada…or next year’s Quad City Chaos!